When an authorized user opts to add a new test suite, then a form is shown to enter new test suite's information. User will be required to provide title of the test suite. Options to add description and to assign a parent suite for suite being newly created are available, and for assigning a parent suite user can select one from list of pre-existing suites. If custom fields of type "Option box" and "Multiple Choice Option box" are present under the project, then they can be used to define the skip conditions, for this user can select a custom field to be used in condition and select the value for it to drive the condition. Skip Conditions are used to auto-skip test case(s) from execution which are not required or cannot run on a specific configuration. For example, if for a test suite which need not to run in local environment, then a custom field named Environment can be created with different options like local, staging, production etc., then user can add skip condition for local environment for that particular test suite. 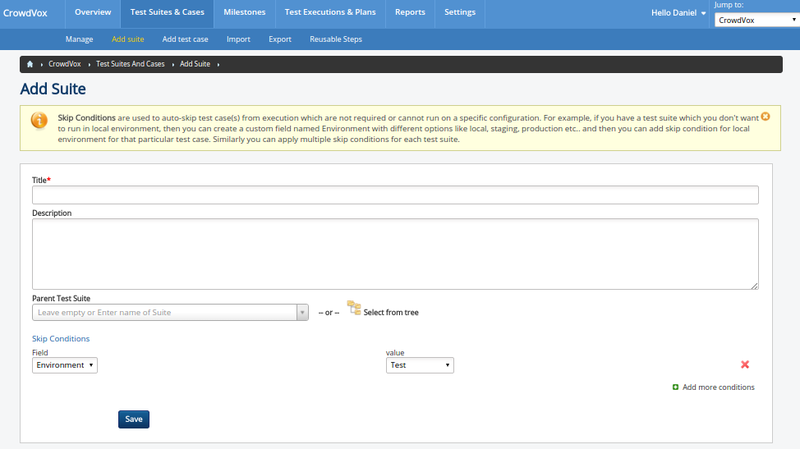 Similarly user can apply multiple skip conditions for each test suite. Here, title is the only mandatory field.